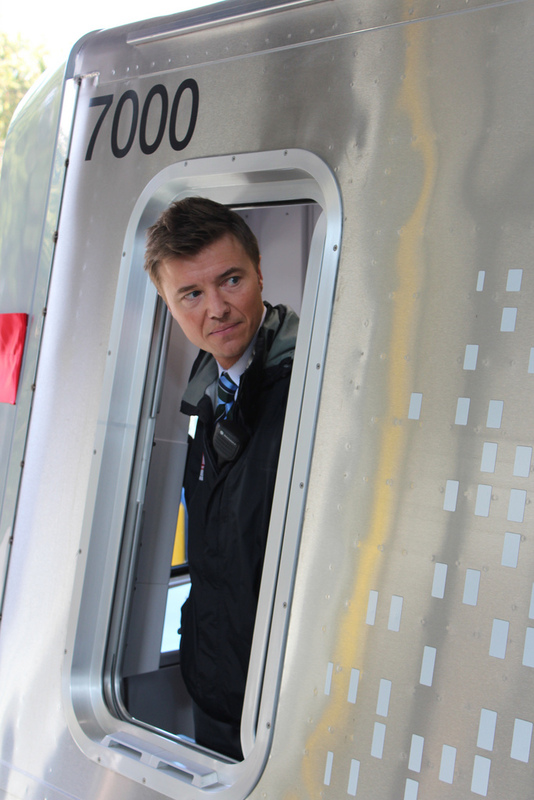 Is Metro Stealthily Cutting Service? 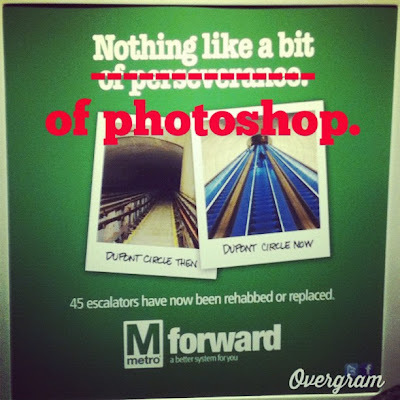 Is Metro Bleeding Money Over a Technical Snafu? New Employees: Blessing or Curse? Where's the Dupont Escalator Party Now? Thanks to everyone who contributed as well as all the readers, tweeps and friends on Facebook. Also thanks to all the Metro people who've come forward and shared their stories! Happy holidays, and see you in 2013, barring some major Metro news. Update: Metro told the Examiner they do it every year. Can anyone remember an announcement about this ever? Remember, Metro has already cut overall service, so I wouldn't put something like this past them. This is by the south parking garage. They had all of it poured, and had the structures installed. Then a few days ago, jack hammer central. Back in February, Metro announced there would be some major construction at the Vienna Metro. They said it would take "approximately six months." Here we are in December, and the project is not yet done. One rider has noticed the screw ups. Remember it was at Vienna that Metro took nearly a year to build a staircase. I am curious about the Vienna project. Have you heard any news, delays, or cost over runs? I walk by there every morning, and a few things have me worried. I'm not construction expert, but it would seem to me that when you pour concrete roads and sidewalks, its kind of expensive to tear it all up and re-pour. I have witnessed several such events. They poured concrete side walks by south garage, even put in the mounts for the lights and started putting in the bus shelters. 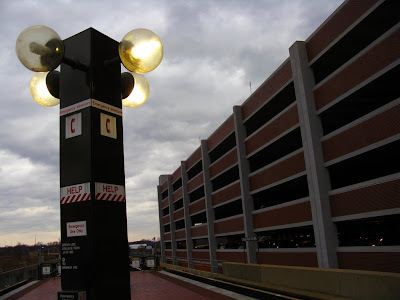 Then I noticed yesterday, that they had to jack hammer around all of the light pole fixtures. 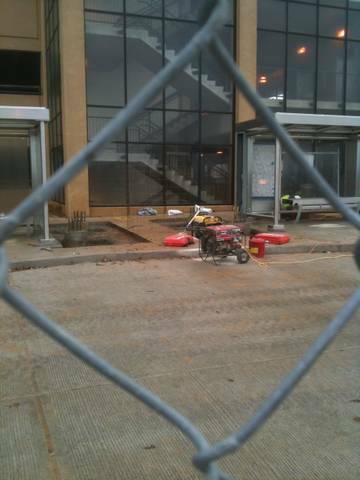 Not sure, but they were jack hammering dangerously close to the brand new shiny bus shelters. Not sure if any were damaged but wouldn't be surprised. Also, last week they tore up the new concrete in the street, and they had to repair the garage exit stairs. Another thing is walker safety. With the new daily traffic patterns, not enough overhead lighting and unmarked crossing lines, its a bit unsafe to navigate on foot. Do they have completion target dates for this project? G. said the temporary bus shelters are still in use some 10 months after they were moved. My bus the other morning (the 7W into Pentagon) got in a fender-bender out on the 395 HOV lane—as far as I can tell we rear-ended a car. It wasn't terrible—a big jolt and my neck's a bit stiff, but I didn't see any damage on the other car. The issue is how our driver handled this. He did not say or do anything after the accident—he simply sat there. He didn't ask if everyone was okay, didn't tell us what had happened, didn't tell us what would happen next or how long we'd be waiting, didn't check on the driver we rear-ended. We just sat there for 10-15 minutes in silence. The driver also didn't move out of traffic (which was not helped by the vehicle we hit, which didn't pull up much at all). The rear of the bus was sticking way out into the right lane, forcing rush-hour traffic to go into the left lane to get around us. I was seated at the right rear of the bus and I was directly over the edge of the lane, so the whole left side of the bus was out in traffic. I was really disappointed by all this—I have a much higher opinion of MetroBus than MetroRail, because the bus drivers seem to be so polite, there is some customer service, and things are much more efficient and clean. It really surprised me to see something potentially serious like this handled with such nonchalance. While Metro is touting its "succesful" progress by taking out full-page ads that haven't been proofread, it sounds like their Momentum "conversation" is exactly what we all thought it would be. 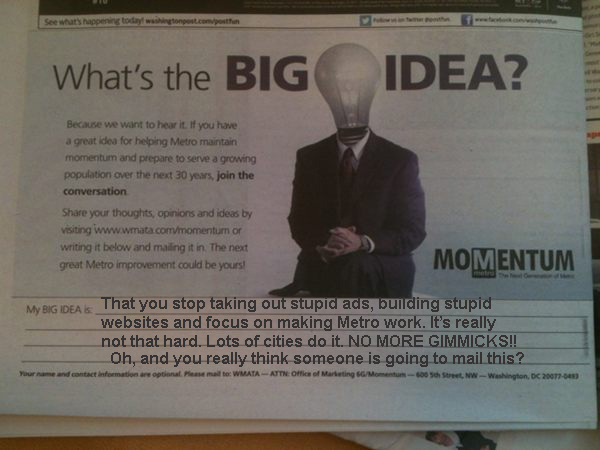 So, yesterday I received an email from Metro's Mindmixer campaign. I had forgotten that I signed up for it when I read about it on Unsuck a few weeks back. Anyway, the email was soliciting Metro riders for ideas for future Metro improvements. The email also said something to the effect that, "with 1.2 million riders everyday, we must be doing something right!" This humble-brag infuriated me. Of course they have 1.2 million riders everyday, many people have to take the Metro each day, several for free. It's basically a monopoly. 1.) Don't claim you're doing something right because you serve 1.2 million people each day. Most of us are basically forced to take this shoddy service. I only ride because it's free for me, and I still contemplate driving instead even though it would cost me over $2,000 extra each year. 2.) Maybe purchase trains that don't force crowding and have those terrible seats where you have to ask people to get up to leave. Where have you ever ridden on public trains like that? 3.) How about invest in more transportation nodes so there aren't various types of single points of failure? It's ridiculous. 4.) Stop reducing bus routes that serve areas that are Metrorail is inaccessible. 5.) Your PR person is awful. You blame passengers for accidents and don't communicate well at all. Fire whoever is responsible. 6.) Where the escalators are only 10 feet or so, just make them stairs that way people are constantly moving versus the lazy who just sit there and block people in rush hour. 7.) Turn on some lights in the dark Metro stations. It's hard to read. 8.) If I enter a station, see that there's a 15-minute wait and decide to leave and walk, STOP CHARGING ME. I DIDN'T RIDE A TRAIN. I HATE YOU FOR DOING THIS. IT SHOULD BE ILLEGAL. 9.) Make it so the bus drivers actually charge everyone for riding. The system is losing money, I see people ride for free every time I ride a bus. I want to pay. I want more money and more services, not a free bus ride every once in a while. 10.) Make a pedestrian tunnel between Metro Center and Gallery Place. It shouldn't be difficult and would probably help with congestion. Sure, I could have spent some time refining a few of the points, and maybe the caps lock in #8 is not the best form (but that really does infuriate me), but I thought most of my points were actually rather reasonable. I support the idea of a good public transit system. By the end of the night, I had a few people post responses to my post. They were all positive. One said "I couldn't agree more with all of your points." 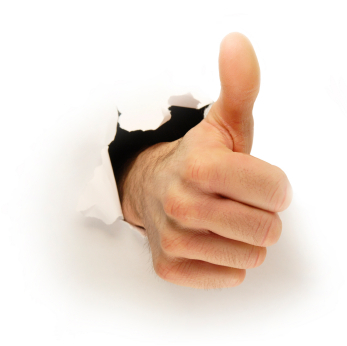 I felt good and thought maybe there'd be an ongoing conversation about some of the easier ideas to address. I woke up the next day, and my post was flagged for removal three times and ultimately taken down from the website. Do you think other actual Metro riders were so taken aback by my ten points that three of them actually flagged this post for removal, or do you think staff at Mindmixer got involved because I took a shot at WMATA's PR guru? Did I offend their Omaha ways? 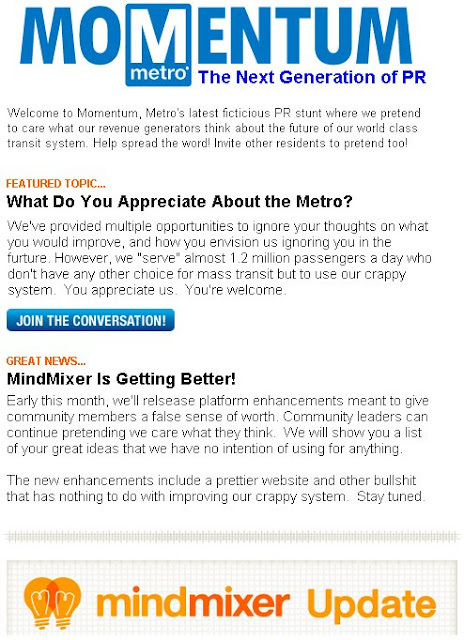 In case anyone actually believes that Metro Momentum/Mindmixer was actually about WMATA listening to ideas as opposed to just being yet another high-priced PR scheme, I thought you might be interested to know that I responded to their Thanksgiving "What are you thankful for" thing by saying "I'm thankful for independent news sources like Unsuck DC Metro which actually report on WMATA's myriad failings instead of credulously republishing press releases" and was promptly banned from the site for "inappropriate behavior" in form of posting "obscene, hateful, or derogatory" content. Mindmixer's CEO did not respond to an opportunity to comment. I have been meaning to write this post for a while since I was in Istanbul about a year ago, but George beat me to it. My experience was the same, though I was only there for a few days. I remember the "PIDs" for the funicular up to Taksim Square even counted down by the second. Be sure to leave your impressions of other cities' transit systems here. I just got back from several months in Istanbul, Turkey. While there, I didn't have a car and depended on mass transit for pretty much every move. Let me start by saying Istanbul puts DC to shame. I never, ever ever was offloaded there, and I was a heavy user of the buses, subway, streetcar and even ferries. Furthermore, it seemed almost magical. When I needed to take a subway to a bus, the bus was there. When I needed to take a streetcar from the subway, the streetcar was there. And in Istanbul, they even have ferries mixed into the picture. Yeah, they go on a schedule, too. Amazing how a schedule helps riders. Mind you, I'm talking rush hour, late night, Saturday, anytime. To paraphrase Steve Jobs, it just worked. 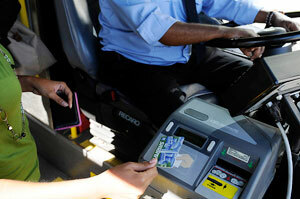 Fares are just over a buck, though on some transfers you do have to pay again. That was my first experience with a mass transit system outside of DC, and it really opened my eyes. Metro is really not a good value at all, not to mention how shaky the service is. The U.S. ranks first in nominal GDP while Turkey ranks 17, behind Mexico. The notion that the Washington Post is in bed with Metro is a hard one to shake off, but starting at 8:30 this morning, it looks even worse. 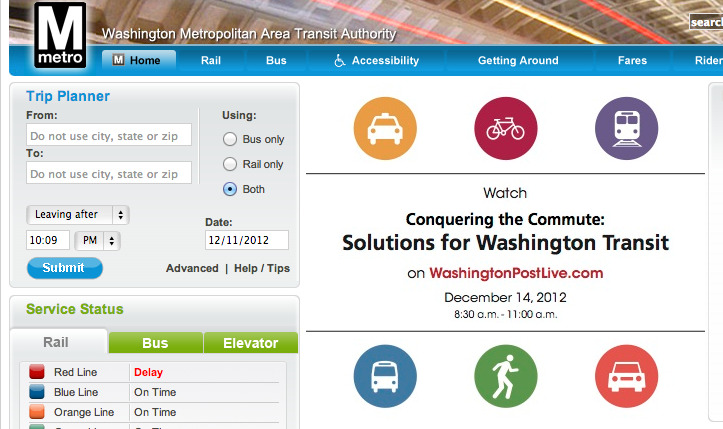 That's when the Washington Post, through its Washington Post Live PR brand, is hosting a "media event" called "Conquering the Commute," and, ironically, the horribly named event is sponsored by Metro! Also sponsoring is the American Public Transportation Association, a lobby group, and the Greater Washington Board of Trade, a regional business association. The event ostensibly "will gather experts, to discuss how transportation updates and investments are crucial to the health of the region and to highlight the latest in smart improvements that create jobs and keep DC-area commuting efficient." The speakers appear to offer a predictable, monotone selection of views. To have Metro, one of the dumbest organizations in the region, sponsor an event on "smart improvements" is risible. Watching Metro, the same transit system that's cutting service, team up with the dying Washington Post is just kinda sad. But it doesn't stop there. Two members of the Post's objective editorial staff are scheduled to be moderators. They are Robert McCartney, a local columnist, and Dr. Gridlock, who allegedly covers Metro objectively. I wrote McCartney, who wrote about this blog some years ago, asking if he thought there was any conflict for Post editorial staff to participate in a Metro-funded event. He referred all questions to Mary Jordan, the Post's editor for conferences and special reports, the mastermind of the Post Live events. She did not respond. I'd like to first give you some context about how these events work. This sponsorship follows all of our conference guidelines. We have multiple sponsors for this event, this discussion covers additional transit topics other than Metro, no one from WMATA is on any of the panels, and they do not have any say in the content of the event. As to your question about how much WMATA paid, as a general rule, we never discuss how much sponsors and advertisers pay. I asked Metro how much they paid. They did not respond. It seems like there are a few distinct concerns from a journalistic point of view. Who is sponsoring the event? Do the invited speakers represent the full spectrum of points of view on the issue? And does the event sponsorship raise concerns about who is invited, and who isn't? It would certainly be easier for the paper to maintain its independence if it chose to steer clear of convening public forums sponsored by industry or government groups that have a clear stake in the policies being discussed. I wonder if the Post--and commuters of all kinds--would be better served if the Post attempted to reassert itself as an area watchdog and produced good, hard-hitting news about Metro, for example, instead of participating in what is basically a money making PR stunt paid for, in part, by Metro. Maybe the coziness between Metro and the Washington Post is something that just bothers me, but I wanted to make sure it was noted. I wish someone on the Metro board would ask Metro about this. To me, Metro's future looks worse than I'd ever thought, as promised service levels from 2006 to 2011 don't appear to have materialized and labor costs continue to balloon, according to data from the National Transit Database (NTD). The below chart paints a very ugly picture, showing just how much promised rail service appears to have never happened, despite Metro doing everything possible to make it look otherwise. Transit agencies like Metro are required by law to report certain performance statistics to the NTD. According to the website, the stats are used divvy up some $5 billion in Federal Transit Administration funds among the nation's transit agencies. The "revenue mile" referenced equals one mile traveled by a vehicle, in this case a rail car, with paying passengers on board. 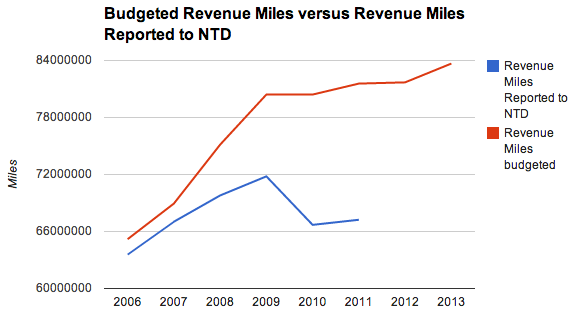 In the chart, the red line shows the number of revenue miles Metro said they would provide (and presumably were funded for) from 2006 to 2013. The numbers can be found in the approved budgets. It shows, as you can see, a steady increase in proposed service--on paper. 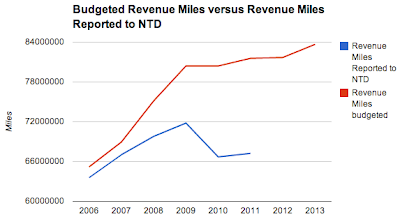 However, the chart's blue line is the number of revenue miles Metro reported to the NTD as actually having been delivered. The gaps between projected and reported have grown, sometimes dramatically, yet Metro keeps giving a rosy outlook year after year. In 2011, for example, Metro budgeted for 81,569,545 revenue miles when it reported to the NTD that it only ran 67,234,252 revenue miles. That's an almost 18 percent difference. One could look at it like an 18 percent cut in promised service. Perhaps the loss of revenue miles is due to all the track work, but if that were the case, why does Metro continue to raise the estimates in its budget documents? I wonder how the jurisdictions feel about funding a service Metro appears to not be providing. I know how riders feel when the fares go up and the service doesn't improve. 2009, the year of the deadly Red Line crash, is an inflection point for both budgeted and reported revenue miles, but the reported miles nosedived while Metro's promised service remained flat for the year. Suddenly, reports of ridership dropping by five percent recently look pretty good considering what looks like an 18 percent cut in service. Meanwhile, labor costs (salaries, wages and benefits), Metro's biggest expense, rose a whopping 30 percent (19 when adjusted for inflation) from 2006 to 2011. 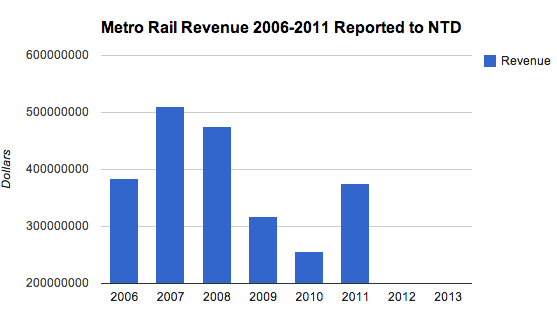 In 2006, Metro spent $831,667,228, and in 2011, it spent $1,082,683,205, according to the NTD data. It should be noted that the NTD has quite a big caveat on its data, but if they're basing funding on it, it can't be that bad. Both NTD and WMATA data seem designed to be as opaque as possible. *This article was done in collaboration with Michael Perkins, who due to a misunderstanding, wrote a similar article at Greater Greater Washington. 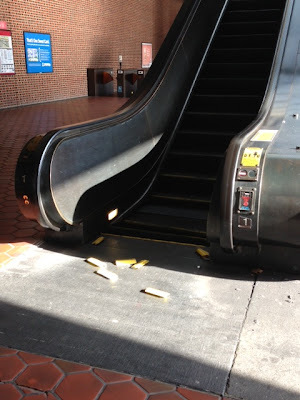 How Long Until More are Injured on Metro's Escalators? I take Metro often to hockey games downtown, and while the NHL has been locked out, there was a special AHL exhibition the other evening between the Hershey Bears and the Norfolk Admirals at Verizon Center. After the game, the exit crowd was taking the second of three refurbished units down toward the platform at Gallery Place. The escalator suddenly stopped, thankfully to design this time, but at the landing there was a misaligned jumble of stairs not unlike what we've seen in Metro incidents before. I'm thankful it was not worse. The first stair at the comb plate was angled downward about 20 degrees or so, so that the rear of the step was punched up at that angle - and the second had seemed to impact lesser beyond that maybe half the inclination - the one or two steps on the flat landing area after that were appropriately flat and aligned. Given that these escalators at Gallery Place were refurbished less than two years ago, I find this a frightening lapse of maintenance and yet another example of Metro incompetence with regards to escalators. I apologize for the lack of pictures, but I wanted to get away from the machine as quickly as possible. Wanted to alert you and your readers to an escalator situation at King Street station. I was on the escalator (with about 20-25 others) when the unit abruptly jolted to a halt that caused riders near the bottom end to trip over what appeared to be components of the escalator on the ground nearby. The passengers were startled but thankfully, there were no injuries. The station manager seemed surprised as well, and immediately cordoned off the escalator. I believe these kinds of incidents continue to happen and will continue to happen because of this. 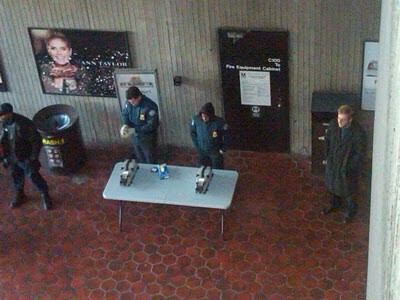 Just this past October, there was another incident, and Metro has a history of covering up issues. It's cyclical. It is due to new classes of operators that come into the system. One started a couple weeks ago. I am sure they have it drilled into their psyche that they must maintain schedule at all costs. Soon, reality will set in that maintaining schedule is just not as easy as it was taught to them. There is no way they could maintain that on the mainline. Also, they think they are falling behind schedule so they will close doors faster to try to "make up" the time they have lost due to something that has previously screwed the line up. They will eventually get into the rhythm that all operators get into. This keeps them from getting too far out of whack. It could also be a lack of training. 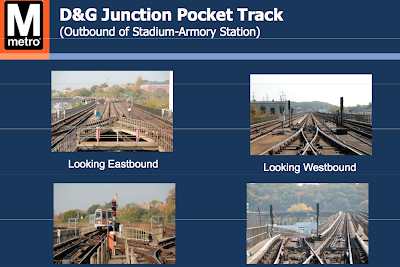 A very reliable Metro source calls Metro's reasoning for extending the Silver Line from Stadium Armory to Largo "total bullsh*t."
The pocket track uses #6 switches and due to an aerial construction design, #8 switches cannot be installed. The entire pocket track is on an aerial structure and will require a high level of maintenance to maintain a high level of operational performance. The length of the pocket track is not adequate for reliable 8-car train operation. Yesterday, during the board meeting, Metro's number two, Dave Kubicek said a failure at the D&G could be "catastrophic." This all sounded rather strange to me, so I asked very reliable source about Metro's reasoning. Here's what the source said. They turn trains there all the time. They store trains there during football games, and for large events downtown that require a lot of trains in a short period of time to alleviate crowds. They have been doing it for 30 years. The 8-car train thing is ridiculous. If these switches are that dangerous then why are they using them at all? Also, did they balance the maintenance costs versus the extension cost? I haven't seen anything about that. According to another source, before Rush"+," Metro routinely turned Orange Line trains around at the D&G. The same source said Metro should have upgraded the switches there with guards (ostensibly to prevent derailments) as recommended by the NTSB after a 2007 derailment. "There are several places Metro turns trains around that are the same length as the D&G," the source said. "They turn them around at Mt. Vernon Sq. at about the same pace they're talking about with the Silver Line, too." In a Washington Post article, Metro officials said "turning trains [at D&G] would require a level of precision difficult for all but the most skilled operators." I also thought it very ironic how just last week Sarles was bragging about the new hires stepping up to the plate. Then, this week, the operators are not competent enough to pull up to a signal, key down the train and go to the opposite end, key up and go. Most people could be trained to do that in 4 hours. It's first day operator stuff. Here is what this all comes down to. They do not trust the new operators. PERIOD. The source went on to explain the mistrust stems from the fact that Silver Line operators will likely be the newest in Metro's fleet. There are several reasons why, they said. First, they will likely have to report to West Falls Church, considered by many one of the worst places to work because it is far from where most operators live, and many hate working for the West Falls Church Division superintendent. Furthermore, operators at West Falls are assigned "awful" days off, and the runs blocks (shifts) are "awful." "A lot of runs start at 6 a.m., make one round trip, and then the operator goes off duty for 4 or 5 hours only to come back on duty around 2 p.m. and make two round trips," a source said. "No one with any seniority would pick runs like that." Another source said they thought the change of plans for the Silver Line was "brought about by a lack of confidence in the equipment, even the upgraded equipment, and the people. That's why it's going to be extended, and that's why it's going to cost more." The extension could cost as much as $4.5 million to the operating costs of the new line, according to reports. 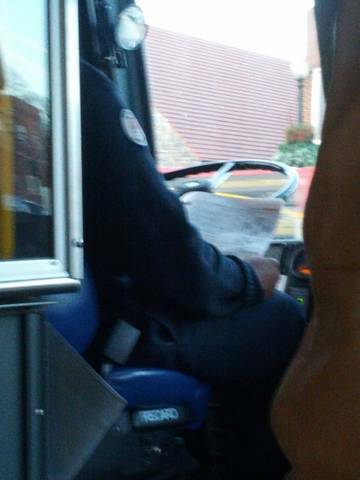 During my commute last Monday morning on the D2, the bus driver was reading a newspaper for a long stretch of the route, both while the bus was stopped and while it was in motion. I emailed WMATA about this and asked for a specific response, which I thought was reasonable given the seriousness of the safety issue (I mentioned that I'd like to provide them with the attached photos and video). 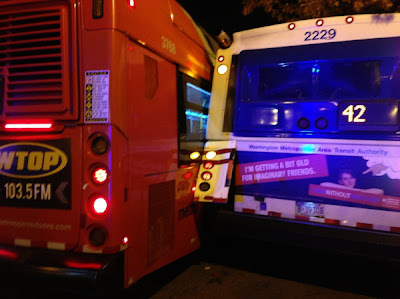 This was a westbound D2, leaving Dupont at 7:30 AM, bus #3077. It took a while, but WMATA finally got back to the rider. I got a call from someone in WMATA customer service this morning, telling me they'd started a proceeding against the driver in question. The guy gave me the name and number of the person in charge of investigating the driver, and an email to send photos and video to. So at this point I'm satisfied with the response -- it sounds like they're actually taking this seriously, and I'd like to give them credit for that. An [police officer] at Silver Spring Metro stopped me because I was going though the gate but my card did not register. I stopped and gave him my card, which is a handicapped card (half fare) and the ID that Metro gave me to buy such cards, with a letter from my audiologist (I am hearing impaired.). The officer took my ID card and put it in the manager's booth. I was not given it back. He told me "this is an elderly person's card." No it's not, it is the handicapped card that was issued to me by WMATA. 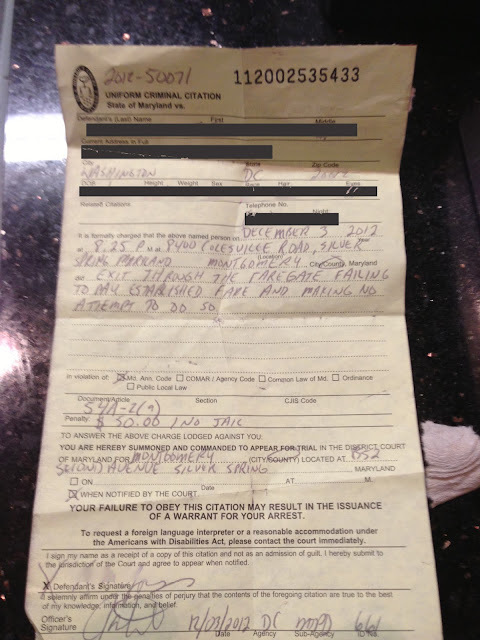 He then denied I had given him my WMATA-issued ID and wrote me a ticket. When I complained that he had confiscated my card, I was told to sit down or face arrest. I signed the ticket because it's better than a night in jail. Metro says they arrested two people and the incident is still under investigation, according to this report on Fox. Seems as though quite a few perps got away. Friday night (11:15pm) fighting breaks out on Green Line at Fort Totten stop after a black girl grabs a cell phone from a white college student. The victim ends up being punched and beaten on the platform when she runs after the thief; a couple of the thief's friends pushed her down and beat her until she started bleeding around the mouth. The victims's friends (a mixed crowd of 8-10 Univ. of MD students) retaliate by not letting the train doors close as they try to get the cell phone back. Police (Metro & DC) finally arrive but fail to let the victim identify anyone and instead let the train close it doors and proceed on. this was actually the last train of the night running from Greenbelt to DC... Even though Metro police said they would stop the train at the next stop, it's unlikely the matter was investigated because they didn't bother to talk to any of the victims. WOW!!! What a night and a horrible first time visit for some young college students. At the end the MTPD officer urges the cameraman to turn off the camera and says there are police waiting at the next station. That may be true, but the witnesses are all at this station. So let's pretend, and I stress pretend, Metro's customer satisfaction survey is 100 percent accurate and 80 percent of Metrorail riders are indeed satisfied with the service, and 84 percent are happy with bus service. After seemingly constant fare hikes, a new board, a new GM, years of weekend and nighttime track work, escalator replacements, straight As on all their "vital signs" reports, tons of new hires, new buses, Metroforward, Momentum, Rush+, pats on the back from every "stakeholder," and hundreds of millions spent "rebuilding the system" to "improve safety and reliability," it's about time the hard work and "investment" started paying off with higher numbers of satisfied riders, right? Back in 2008, less than a year before the fatal Red Line crash, 85 percent of Metrorail riders and 78 percent of Metrobus riders were satisfied with Metro service. Back in 2007, 87 percent of Metrorail riders and 81 percent of Metrobus riders were satisfied with Metro service. I could not find releases about earlier surveys, but in the two above, Metro said the numbers "remain consistent" from 2004. Weird thing is that in 2003, when I'm pretty sure everyone thought Metro was at least little better than it is now (it certainly was cheaper), the satisfaction with Metrorail was 72 percent and 76 percent for Metrobus. Metro used what appears to be a different system of surveying in 2003. I suppose some of this year's lower numbers could be explained by the constant track work over the weekends, but perhaps, if Metro were honest and forthcoming with riders and did a better job at managing expectations instead of rolling out self aggrandizing PR campaign after PR campaign, its relationship with its riders might be a little better. Instead, Metro continuously brags and boasts about how everything is just fine. If you live on PR instead of real accomplishment, eventually, even the cooked numbers won't lie. If you're interested in some readers' comments on the methodology of the Metro survey, check out this and this. Also you can vote in the Unsuck rider satisfaction survey here. Are you satisfied with Metro's service? In recent board meetings, Metro GM Richard Sarles has boasted about how many new employees Metro has been hiring to help "rebuild the system." But just what kind of people is Metro hiring, and are they helping or hurting? 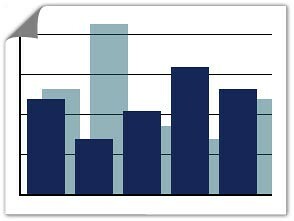 The number of new employees and the loss of veteran employees over the past 18 months was a major concern in last week's FTA safety "audit." In the Automatic Train Control (ATC) Department, which is responsible for crucial safety systems to prevent trains from colliding, two sources say they are very concerned for their safety and the safety of riders because of the low skill--and language--level of new employees. "Some of these new guys have developed terrible working habits that would take an old timer years to have the nerve to pull off," said one source. "Metro is partly to blame for that. The influx of workers in ATC who walk around without the basic equipment needed to perform their jobs like keys to access rooms, radios and the lack of basic troubleshooting skills, have created a work environment that just isn't safe. So, for all the talk of safety and patting themselves on the back, it's all make believe." Another source said the new hires have nothing to do. "They can't do anything because they don't know how," they said. "They're more in the way than anything else. It's just a matter of time until there's another incident." 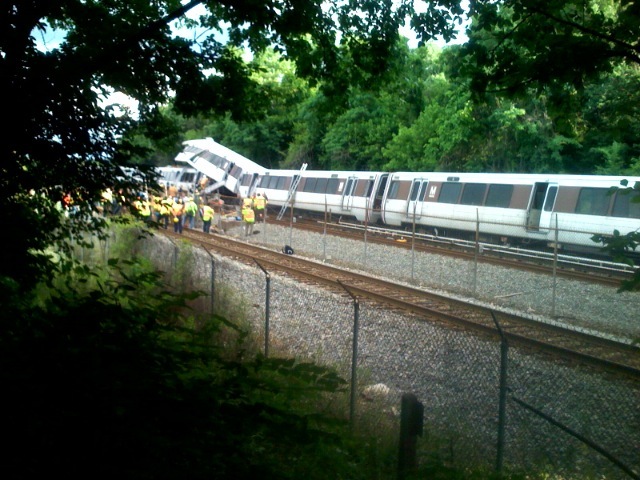 One newcomer to ATC was responsible for the recent derailment at Rosslyn. On the rail operations side, the unskilled and inexperienced new hires have lead to delays and damaged equipment. Particularly, the position of line supervisor has led to some embarrassing incidents, says one Metro source. Line supervisors are in charge of the train operators and station managers. They are supposed work their way up the ranks from operator or station manager and over the course of that experience, they are supposed acquire the skills to troubleshoot train malfunctions at a higher level than an operator, for example. When a train breaks down, a line supervisor should be able to get it moving again so that "normal" service can begin. Yet recently, Metro hired several supervisors with no experience at all. One was a baggage handler before coming to Metro, says a source. 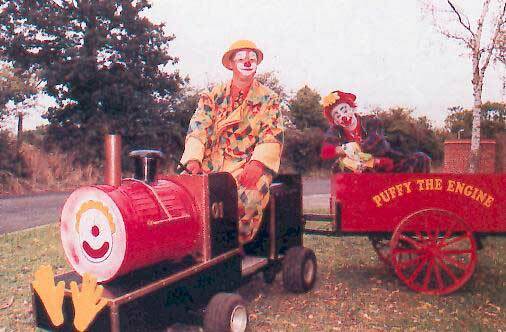 One of these new hires was recently responsible for moving an out of service train out of the way so "normal" service could resume. They were told to move the train to Pentagon City, passing through Arlington Cemetery. At Arlington Cemetery, the radio system changes frequency, and train operators are suppose to change from "ops 2" to ops 3," said a source. "There's a big sign" reminding them to do that, said the source. Here's what happened according to the source: This new hire did not change his radio frequency. So instead of going to Pentagon City, he went through Pentagon and then stopped. Because the supervisor didn't change the radio frequency, central control was unable to reach them to tell them to move. Because that area is a dead zone for cell phones, they were unable to reach them via a Metro-issued cell phone. The train kept sitting there, incommunicado. It was so long that Metro began single tracking around it, until one train stopped next to it and another employee got on the idled train and told the supervisor--finally--to move. Another new hire, when taking a train to the yard failed to conduct a basic brake test, said a source. The result was that he barreled the train down the tracks with brakes engaged on one of the cars and was only made aware by a passing train operator who saw "smoke and flames" coming from the train. Another one of these hires apparently failed to understand the basics of railroading and refused to move the train because he had no speed command readouts (a common occurrence at Metro) even though central control had told him it was OK to do so. "They're wreaking havoc out there," said the source. And what kind of punishment is meted out when something like this happens? "Metro is afraid to deal with anyone one-on-one," said a source. "They'll send out a memo to 500 people saying anyone caught not answering their radio would be in trouble instead of going to that one person who did not answer their radio." Another source agreed "wholeheartedly" with this and said it was demoralizing to a lot of Metro employees who are trying to do the right thing. And how does the person in charge of line supervisors spend his time? "One of their new things was to check the station managers to see if they're wearing white socks," said the source. "They're not part of the uniform. It's ridiculous. Your performance is related to how much paperwork you can generate." These line supervisors command at least $80,000 in annual salary, the source said, and there are roughly 70 of them Metro-wide. How are these people getting in? All sources agree that Metro is having a hard time attracting skilled workers and are largely having to select from the "bottom of the barrel," according to one source. "The pay and the shift work make Metro unattractive to someone with skills," they added. Furthermore, all Metro sources interviewed for this post confirm that exams have been dumbed down to the point of being meaningless. For positions that still have to take exams, a Metro source said very specific study guides are handed out. The study guides break down the number of questions per topics--Breda brakes--for example and will cite the relevant passages in instruction manuals to read for the exam. "They just memorize, but it's useless for what they're actually expected to do on the job," said a source. "There's no thinking involved. There's no applied knowledge." Of course, they can always cheat. And many exams have been done away with completely. "They did away with testing the new hires, to the point that we are now teaching some of them the basics of electricity and electronics at best, and English at worst," said a source in ATC. "We are becoming a jobs program." Even the training is being reduced. One Metro source said that the training period for train operators used to be 18 weeks, it was later trimmed to 16 then trimmed again, and now, the source said, the training is moving to just six weeks. All sources scoffed at the FTA findings about the training for new employees and the audit as a whole. "A real, balls to the wall investigation, would see me coming into work and have my supervisor hand us a phone number or email for us to contact the investigating agents with any concerns," said one veteran employee. "That has never happened since I've been at Metro." Another source said whenever the FTA and NTSB come around, "they're at the mercy of Metro's management, and they're not getting a true feel for how things really are for most of us." Long time since we did one of these. Previous ones are here. Mine would be "Mauve Line to Mars, next station stop, the moon. Please use all 1000 doors." I was on the Orange Line yesterday morning when a man sitting close to me suffered a series of seizures while the train was at Federal Triangle. I was completely shocked by what seemed to be complete incompetence and bad attitude from Metro employees! Passengers were attending to the man and calling 911, while Metro employees were just walking around aimlessly, in no rush to assist. I’m disgusted of the lack of professionalism, but more so by the lack of sympathy towards a suffering human being. If ever an organization needed strong whistleblower protection, it’s Metro. 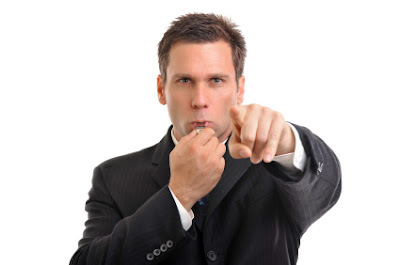 At substantial risk to themselves, whistleblowers buck the system, attempting to bring to light waste, fraud, safety violations, mismanagement, and other abuse. Metro itself has recognized the value of whistleblowers, with a whistleblower rights policy that includes purported protections against retaliation for those who speak up. This policy was strengthened in the wake of the 2009 Ft. Totten crash when investigators discovered a culture of retaliation against Metro employees who tried to speak up about potential safety concerns. Unfortunately, as recent release of Metro documents reveals, a major whistleblower protection is turning out to be pretty toothless. Which is a shame, because it makes it all the harder for would-be whistleblowers to try to call attention to the wrongs they encounter. And as we know too well, Metro has plenty of unsavory practices that could bear some sunlight. Governmentattic.org, which proclaims its mission as “rummaging in the government’s attic,” obtained copies of the decisions by Metro’s Whistleblower Retaliation Hearing Panel. This is a trio of senior Metro executives, which hears cases of alleged retaliation against Metro whistleblowers. The documents cover six cases back to November 2010. Although Metro has committed itself to full investigation of problems and protection of employees from retaliation, the documents show the review panel hasn’t exactly been breaking a sweat to get to the bottom of things. The documents show the panel has made minimal independent investigation of cases; for example, deciding to forgo investigation of incidents with those complaining or their supervisors. In addition to that relaxed approach, the panel has also done scarcely anything to explain the thinking behind its decisions. (Assuming there is any thinking.) It’s important to lay things out, because only in seeing how the panel weighs evidence can would-be whistleblowers evaluate how much protection they’ll get – or not. Put simply, to see what flies and what doesn’t. Customarily, legal decisions state the rule at issue in a case, present the facts and evidence considered, and then provide a line of reasoning based on things like precedent and case law that allow parties to see how a decision was reached. Put it all together, and the message is pretty plain: Whistleblowers, we don’t have your back. Whistleblowers take tremendous risks from the start, and the panel is supposed to be the last line of defense against unjust retaliation. But with friends like this, it’s easy to see why whistleblowers would feel an even bigger chill as they weigh whether to step forward. That’s bad for the employees, but even worse for the agency and the traveling public. @listenupwmata Takes appx. 4-6 weeks to replace laminated glass, each is custom. If its a safety hazard units are blocked. Reply emailed. Metro's response seemed odd. Surely even Metro would not order something as absurd as custom made glass panels for its escalators, so I asked an expert. Sounds like more B.S. I believe they use 1/2" Lexan panels. Lexan can be purchased as a sheet like plywood and cut with the same tools. If they don't have it in stock, it can be obtained locally same day or overnight shipped. Another escalator source said leaving shattered glass like this was "rolling the dice" because if that glass shattered there's be a "significantly more expensive" cleanup and repair job not to mention injuries to riders. @unsuckdcmetro Got a call from CS on Wed.Said it would be replaced Mon/Tue this week.This morning, there was tape on it.So, we'll see. A couple of weeks ago, a reader, "Spataps," called me the "Rush Limbaugh of transit." It would have been better if they'd called me the Rush+ Limbaugh of transit but regardless, I invited them to guest post, and they did. It is unedited. I was invited by the site’s author to write this because of comments I posted in his article expressing frustration at WMATAs slow response to FOAA requests. My question for the author and readers is this. Do you really want to improve the Metro? 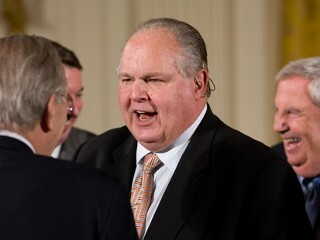 Or do you take your pleasure in attacking it and its employees, much like Limbaugh does with the federal government. If it's the former, as I hope, than I ask you to reconsider your reporting style. I read Unsuck because I want to improve Metro. I hate when trains stop for no reason or have 30 minute headways. I wish metro employees were more courteous. And this blog is the main game in town for only covering Metros' needed improvements. Yet the attitude that the blog takes really frustrates me. I believe yelling at an alcoholic does nothing. To me, your style feels much like that. Much of the time, having taken the metro almost every day for 7 years, I've found it runs okay. Sure, there are problems, but to read this blog, one would think metro was a Florida DMV run by Chicago goons from the 1920s. It's not good, but it's not that bad. To ask for change, I think you need to acknowledge that, or risk being ignored. While ideally metro would respond to FOAA and improvement suggestions systematically, they are human. They're going to be suspicious of the intentions of someone who reports only negative news in an unobjective style. For example, the October 26th update titled "Stalin Would Be Proud." The subject matter, Metro should reconsider its policies on releasing video from bus cameras is fair. The title and delivery are inflammatory, coming close to Godwin's law. This article almost certainly will not lead metro to release its videos, or take the blog seriously in the future. The comparison to Greater Greater Washington is inevitable. GGW has become a widely read blog in the area, with David Alpert turning into the go to guy on smart planning for many in the media and city politics. They are critical at times but write in a style of constructive criticism and also identify bright spots. I'm not saying you need to support GGW's policies, since it's clear many of this blogs readers don't, but Unsuck should follow their growth as an example of success if it really wishes to improve WMATA. -Close the comments for a while or moderate them more strictly. Readers also read the comments and associate them with the website. Many commenters create elaborate conspiratorial, cartoonishly evil, and sometimes racist, depictions of WMATA and its staff. This is not a group that a WMATA staffer considering responding to a question from a reporter cares about pleasing. It'd be great if the comments were a place to share experiences and have real conversation. However, when I came in with some criticism, my comments got voted down and called out as trolls. -Enact some journalistic standards. Not an insult, and correct me if I’m wrong, but I don’t think you have set up some guidelines. Often posts are put up that blame the metro for something that later turns out to be not their fault. See the fire alarm that closed the new Dupont escalators. While you put up a correction, the damage was done. Instead of instantly posting, make sure you’re right first. -Get more contributors. I don’t know if Unsuck is run by one person or if you have help, but a diversity of opinions only improves a news outlet. How to best unsuck the Metro is a topic with a lot of different views that are not represented. By diversifying your writers, you will attract more readers who also care about improving the metro but are turned off by your currently inflammatory style. -Avoid anonymous sources. You frequently cite anonymous metro employees as to the secret real reason why something bad has happened. I have no idea who these people are or if they are even who they claim to be. Maybe they’re about to be fired for sexual harassment or maybe they’re actually right. Many newspapers limit their use of sources or have laid out clear standards for their use. -Lay off the union bashing. I’m not saying unions are perfect, but they do perform an important role in protecting workers. -Get into more detail. What are rail ties? Why do so many of them need to be replaced? Does it really need to take so long? I don't know but I would like to. This leads down the road of more constructive criticism instead of repeated broad attacks. None of this excuses bad bureaucracy, bad employees and late trains/buses. It is an attempt to try and improve those situations in a more constructive manner. Maybe this letter is a waste of time.Maybe you all really just want a place to talk about how much you hate the Metro, much like I doubt Limbaugh cares about changing government for the better. 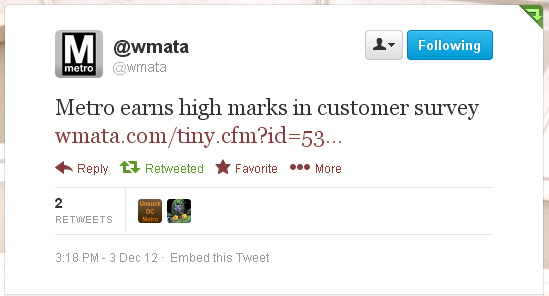 But if you truly care about improving WMATA, than please consider a different type of reporting. I'm off til the next Monday barring some big Metro news. 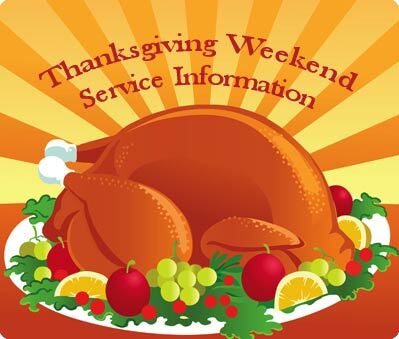 Have a great, and hopefully Metro-free Thanksgiving. Looks like the DC Metro fare collection system was having some systemic problems on Oct. 27 late night. Several of our party had between $10 and $27 wiped off of our cards according to the exit gates and the add money machines. The stationmaster at Crystal City (about 12.45 a.m.) refused to deal with an inquiry about the missing money, and instead said that the exit gates don’t show card values. (Not that it has to do with anything.) When challenged on this point, the stationmaster started shouting and being very aggressive. You’d think that when missing money is visible on the readouts, or the system was down, the stationmaster would put two and two together and have a standard response. Something like “If there’s a problem with the amount on your card, please contact XYZ” or “Here’s a form if you think the money is missing,” etc. I guess that’s too much to expect. *There are issues with Tumblr notifying me of new posts. Emailing your stories to unsuckdcmetro(at)yahoo(dot)com is the best way to post. Anonymity guaranteed if you so desire. Dec. 21, 2010 bag checks at Braddock Rd. via @deafinthecity. I entered the Bethesda Metro after work the other week. As I came to the bottom of the escalators in a crowd of commuters, a security official caught my eye and waved me over to what I'll call the "TSA table." I complied although another security person a few paces away made sure to remind me! Having never seen this setup before, I asked amiably if it had something to do with the election. One replied (and I later learned) that they've been doing this for awhile. My bags were swabbed down while I waited. After the swab tested positive in their little machine for possible explosive material, several more security personnel were called over to the table. There must have been five or six security people gathered around me. I'm not sure if all of them were TSA, but all seemed armed. They somewhat awkwardly swabbed my bags down again, and I was told the dog would check my bag before being escorted to the other side of the tunnel where two officers began asking me whether I'd come in contact with hand sanitizer, etc. They also began writing down my personal information: name, address, phone, place of employment, job title. One officer asked to see my ID. I told him it was in my bag on the other side of the tunnel where they'd left it, and he laughed embarrassed. "Oh, yeah, everyone says that," he said. They seemed suspicious when I told them I had an out-of-state area code for my cell phone. After questioning, I was lead back to the TSA table where the embarrassed officer poked through my bags, then let me go. The officers had this weird mix of friendliness, awkwardness and scrutiny. The whole ordeal was pretty creepy, especially considering the government's ability to detain citizens indefinitely under the NDAA. Had I known my rights, I might have had more courage to protest this search. Now I'm just left feeling unnerved by the thought that I've been "flagged" by Big Brother. People often say your blog doesn't offer constructive suggestions. I think they're wrong, and here's one Metro can do now, for free. I know it's not the most important thing facing Metro, but I think it would help. Break up the Twitter feeds! 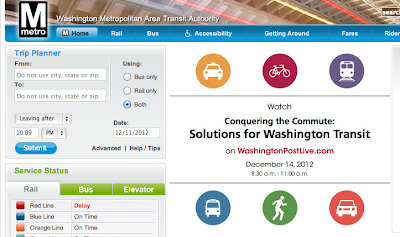 The last thing I want to see in the @wmata stream is response after response to every rider with an issue. I'm not saying ignore riders, but put all that on another feed--@wmatacares or something. Metro is good at coming up with slogans. Maybe Mind Mixer will help---for a fee, of course. 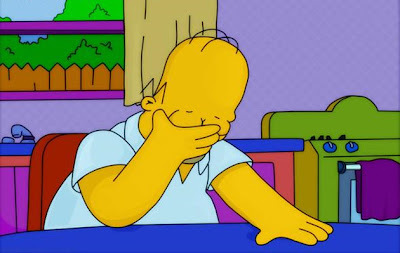 Most of Metro's "help" on Twitter apart from updates of train locations and the reasons for delays isn't really help. Metro pretty much tell riders to contact customer service if they have a complaint. Keep @wmata service related. That's the number one thing most people want from the Twitter feed, so don't dilute it with so much stuff 99.999 percent of stuff riders don't care about. Quantity does not equal quality. I don't know about everyone else, but I read the @wmata feed on my cell phone for the most part. Sifting through tens of tweets between @wmata and a customer over some, mostly mundane, problem keeps me from the key information: Are there any delays? An even more obvious thing for Metro to do would be to make another feed for buses. Finally, and most importantly, don't sass customers! I've seen it way too many times. 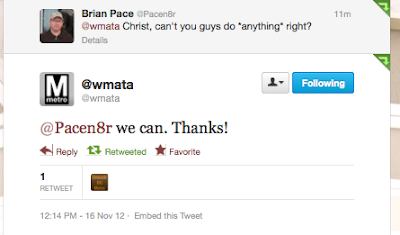 @wmata needs to turn the other cheek, even if a rider sasses them. Anyway, check out @SFBART to see how social media for a mass transit system is done. Honestly though, I'd rather Metro just work so I'd never have to check twitter about them again. At yesterday's board meeting, Metro GM Richard Sarles said the Mind Mixer site had a total of 2,700 unique visitors. He also said the ad pictured above will appear in English, Spanish, Chinese and Korean. So, I opened up the Express and saw Metro is asking me for the next "Big Idea." Really? Don't they have any themselves? Take a look around. Ride the Metro! Read this blog. Tons of no-cost ways to make Metro better right now. Right this instant. I don't get why they spend money to start a conversation that's already happening and has been for years. Maybe if Metro management got out and rode the system a little more, they'd come up with some ideas themselves. Why don't you do something on the Office of Long Range Planning. I thought things would get better there after the credit card scandal (details), but they've gotten worse. They are showered with money they don't know what to do with, so they spend it on stuff like the what if there were no Metro study and websites like Planitmetro and Momentum. The office does study after study of things that will never happen at Metro. A lot of people around here shake their heads with some of the stuff they come up with. The executive leadership team seems to think it can do no wrong. I guess it gives them more pie in the sky stuff they can "wow" the board with. I know for a fact that much of the "conversation" on the Mind Mixer site are people in the planning office. From what I hear, a lot of Metro's highly paid "senior planners" spend a lot of time on the Mind Mixer site talking about things with students and transit geeks about stuff that will never happen at Metro. I'd be very leery of those sites as the artificially generated "conversation" can easily be turned into anything whim the planning office has. Many feel they are a costly distraction from what should be all about a back to basics movement. Several other sources at Metro confirm widespread internal suspicion about Metro's planning department. One of those implicated in the planning department's unbelievable credit card scandal, who later left in its wake, is former WMATA chief planner Nat Bottigheimer. While I can't say for sure it's the same person, someone named "Nat B," from Princeton where Bottighemer now lives, has submitted two ideas to the Mind Mixer site. One is for a Facebook page for each Metrobus line, and the other is to hold a short film competition about the area's transit future. If you want to make your own Photoshop, here's the blank image. 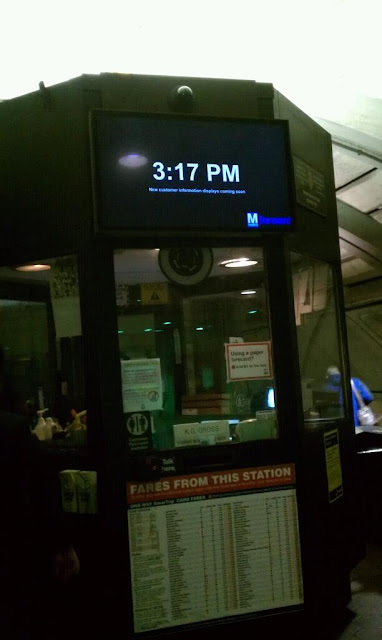 Last summer, Metro started installing flat screen monitors throughout the system. For months, they remained off, serving only to to block the kiosk clocks. Yesterday, some of them appeared to come to life--as clocks. Hopefully, Metro has more ambitious plans for them, but they've been tight lipped about what these displays will eventually show. 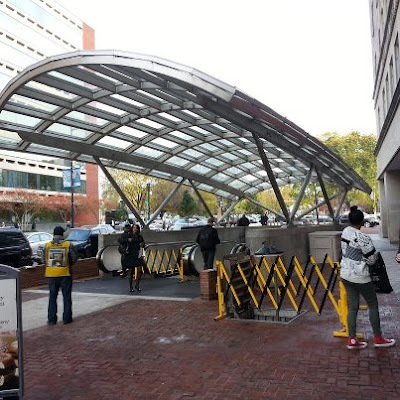 It seems like just days ago that Metro's GM Richard Sarles was out at a live streamed ribbon cutting celebration when the Dupont South escalators opened after over eight months of repair. This project is just one visible example of how we re working to improve safety and reliability throughout the entire Metro system. Thanks to projects like this, along with improved maintenance across the system, we are seeing results. 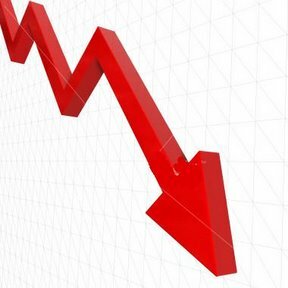 Escalator availability today is above 90 percent, an increase of 8 percent over last year. The ever elusive Sarles was nowhere to be seen yesterday when riders reported all three escalators were out during the evening commute. Metro is aiming to restore Automatic Train Operation (ATO) on the Red Line December 1, said a source with in-depth knowledge. ATO, which basically takes the train operator out of the equation and ostensibly provides a smoother ride, was suspended in 2009 after the Ft. Totten crash that killed nine people. Over the past years, Metro has been replacing hundreds of Automatic Train Control modules along the Red Line. Put simply, the modules are small radios placed along the tracks that tell trains to stop, go, speed up or brake. Fundamentally, they are supposed to keep the trains from colliding. The system failed on June 22, 2009. When working properly, these modules can allow for Automatic Train Operation. During a Nov. 1 meeting of the Safety and Security Committee meeting, Metro's number two, David Kubicek said "the Red Line, for all practical purposes, is done." But don't get too excited for smoother rides just yet. Another action Metro took after the 2009 crash, namely bellying the1000-series cars in a PR stunt, will likely eliminate any smoother ride ATO might offer. Even though the engineers say they brake and accelerate the same, we out here know better than to buy that line of bullsh*t. All one needs to do is stand on the train in the middle where anything is coupled to a 1000 series. All you hear and feel during [acceleration or braking] is the train couplers bucking, and on some, you actually feel it in your feet. Oh, and don't get your hopes up for a return to ATO on the other lines any time soon. At the Safety and Security Committee meeting, Kubicek said it would be two to three years before ATO could return to the other lines. He said 900 ATC modules needed to be installed on the Orange and Blue lines while another 220 were needed on the Yellow and Green lines. Kubicek said the warranty on the new modules was one year, but could not give information about their failure rate when pressed by board member Anthony Giancola. A source in Metro tells me the failure rates are very high on the new modules. That doesn't mean another crash is iminent, but it could lead to more delays. "It's brand new stuff, but it's garbage," said a source. "Metro signs the contract and buys it. We're stuck with it. [Vendors] just install it and leave, and the next morning the stuff starts to fail. For all the money we're spending, we should be getting better return on our investment." 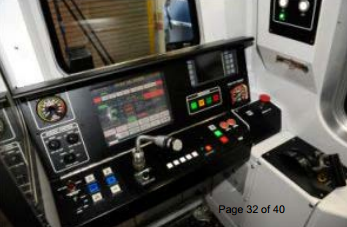 As an interesting side note, the Silver Line is being built with Automatic Train Control modules made by a different vendor from the ones Metro is installing.